For decades it seemed professional sound recording was limited to cumbersome tape-based Nagra machines or DAT recorders that required agonizing real-time transfers. I have been recording Hollywood sound effects for over 13 years. Often I’ve heard a rare sound and wished I had a recorder handy to capture it a moment’s notice. Neither a Nagra or even a portable DAT recorder had the combination of speed, portability and sound quality I needed for professional use. So, when Samson released its Zoom H4 Handy recorder ($299.00), I paid close attention. The Zoom H4 was not the first portable digital recorder. The initial recorder to catch the attention of professionals was M-Audio’s Microtrack recorder. It showed promise, but was not considered seriously by pros since it lacked true 48-volt phantom power needed for the best mics. Other recorders lacked crystal-clear 24-bit recording, or the professional XLR inputs jacks needed for pure, grounded signal transmission. The Zoom H4 stood out. It offered many eagerly awaited pro features at a consumer price: 96k/24bit recording resolution, professional XLR inputs, onboard mics, 4 tracks of recording, and it could also function as an audio interface with your Mac or PC, all for under $300. In addition to these features, the surprisingly small size and reports of a fair on-board condenser mic with good external mic preamps made me purchase one, then three more. It has become my solution for guerilla or stealth recording. Now, after using the recorder for a year, I’ve come to see its limitations, more strengths, and its proper place in the blossoming market of digital recorders. The Zoom H4 is marketed toward musicians. Although I have used it exclusively for sound effects recording, musicians will enjoy the 4 track recording, mic emulation, effects processing, as well as free Cubase software. As mentioned, the recorder also functions as an audio interface so budget musicians will find everything all in one package. Two things about this recorder are apparent right out of the box: its construction and its size. The housing is plastic, and the recorder feels light and cheap. Although it hasn’t happened yet, I constantly fear that a short drop will shatter the thing. I was, however, delighted by its size. It fits comfortably in my hand and can easily be tucked into a blazer pocket. After slipping in two AA batteries (providing about 3 hours of recording time) and a Smart Digital Card I powered it up. The start up time of about 15 seconds is long, and not nearly fast enough to capture that unexpected effect at a moments notice. A menu button on the lower centre of the recorder controls playback, and also returns to the home screen in a fashion similar to an iPod. A toggle wheel on the side of the recorder allows cycling and selection of menus options. The menus are simple, with charming icons, however it should be noted that file management and renaming is a tad arduous. It is best to save these things after you have transferred them to your computer. I formatted the SD card, and take note settings are reset after formating, so you will have to reset your sample rate and preferences each time you format a card. The sampling rate, bit rate and file type (WAV or MP3) can be easily restored by pressing one of the four preset buttons on the left side of the recorder. 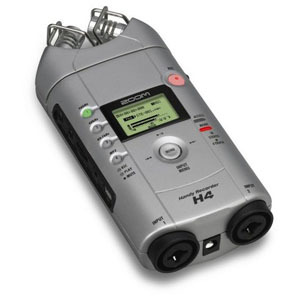 The H4 offers two recording options. You can use the on-board condenser mics, or connect an external microphone of your own via the XLR/1/4i inch jacks at the base of the recorder. The on-board mics capture consistently fair recordings. The recordings are a bi thin but capture a decent stereo image with reasonable depth. The condenser microphone is useful only in interior locations; even the slightest breeze will overwhelm the mic and ruin a recording. Samson includes a foam ball as a windshield cover, but I found it is more useful as a cat toy: it is useless in preventing wind from ruining recordings. If you are holding the recorder in your hand any small movement will be transferred to the microphones. Thankfully Samson includes a basic mic stand and mic sled. look at the recorder. The headphone preamp is weak and it is difficult to monitor. 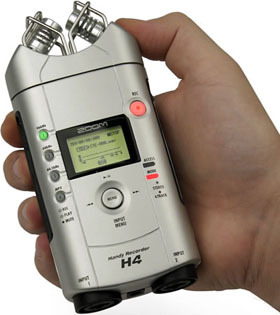 A major pitfall of the Zoom H4 is the recording level switches. Most recorders have a dial to set the input levels. While the H4 does have the ability to fine-tune the input levels, you have to dig down a few menu levels to get at it, which is not helpful under stressful conditions. Otherwise, you are at the mercy of the level switches on the side of the recorder, which have three settings: low, medium and high. This means that setting your levels will be coarse, and you will risk distorting your recordings. I’ve found that setting the levels one setting lower than appropriate works well. However the lack of a dedicated level knob is a major problem with the Zoom H4. Exterior mics can connect to the recorder by the combo XLR/1/4 inch jacks. These jacks set the recorder apart from other recorders in its class. Since the best microphones use XLR connectors you can attach proper cables without having to string a line of adapters between your microphone and the recorder. One sadly overlooked aspect is that the jacks are not self-locking. Commonly (at least to me) a mic cable can slip out of the H4. In the end, the true test of any digital recorder is its microphone preamplifier. No matter how good a microphone is, the recording will only be as good as the preamp you are using. I was pleasantly surprised by the H4’s preamp. I usually use a Sound Devices MixPre and while the H4’s preamp cannot match the quality of a professional preamp, it performed well. I have been able increase the gain of quiet sounds by 15db in Pro Tools without any serious hiss or chip noise being introduced. I am a fan of the Samson H4, and would recommend it for both amateurs and professionals. It is especially useful for stealth recordings. I was recently in New York and while The Metropolitan Museum checked my larger recording bag at the door, I was able to smuggle the H4 past security. Also, the flexibility of the profession XLR jacks have allowed me to connect my Neumann 191 microphone directly to the recorder without using signal-degrading adapters or cables. Overall, the H4 packs more features than its $300.00 price suggests, and is a useful tool for professionals, amateurs and hobbyists. If you can overlook a few user-interface shortcomings and the cheap construction, you will have an inexpensive ultra-portable consumer recorder packed with pro features. About the author: Paul Virostek travels worldwide recording the sounds of cities and cultures. He shares his collection at airbornesound.com, and writes about his experiences field recording, and sharing sound effects at jetstreaming.org. He is also the author of “Field Recording: from Research to Wrap – An Introduction to Gathering Sound Effects“, which was published in 2012.